Hiroo Onoda, the last Japanese imperial soldier to emerge from hiding in a jungle in the Philippines and surrender, 29 years after the end of the Second World War, has died. He was 91. HirooOnoda, the last Japanese imperial soldier to emerge from hiding in a jungle in the Philippines and surrender, 29 years after the end of the Second World War, has died. He was 91. Onoda died Thursday at a Tokyo hospital after a brief stay there. Chief government spokesman Yoshihide Suga on Friday expressed his condolences, praising Onoda for his strong will to live and indomitable spirit. "After World War II, Mr. Onoda lived in the jungle for many years and when he returned to Japan, I felt that finally, the war was finished. That's how I felt," Suga said. Onoda and another World War II holdout, Sgt. Shoichi Yokoi, who emerged from the jungle in 1972, received massive heroes' welcomes upon returning home. 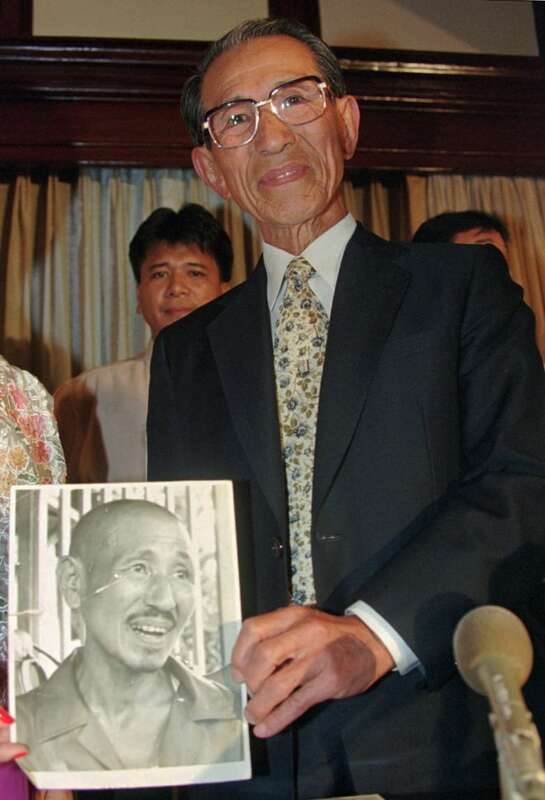 Hiroo Onoda, shown here in May 1996, holds a picture of himself, taken for the first time when he came out of hiding from the jungle, during a news conference in Manila, Philippines, for a sentimental journey. (Bullit Marquez/Associated Press)​Onoda refused to give up, despite at least four searches during which family members appealed to him over loudspeakers and flights dropped leaflets urging him to surrender. After the initial sensation of his return home wore off, Onoda bought a ranch in Brazil. He later was head of a children's nature school in northern Japan. "I don't consider those 30 years a waste of time," Onoda said in a 1995 interview with The Associated Press. "Without that experience, I wouldn't have my life today." "I do everything twice as fast so I can make up for the 30 years," Onoda said. "I wish someone could eat and sleep for me so I can work 24 hours a day." 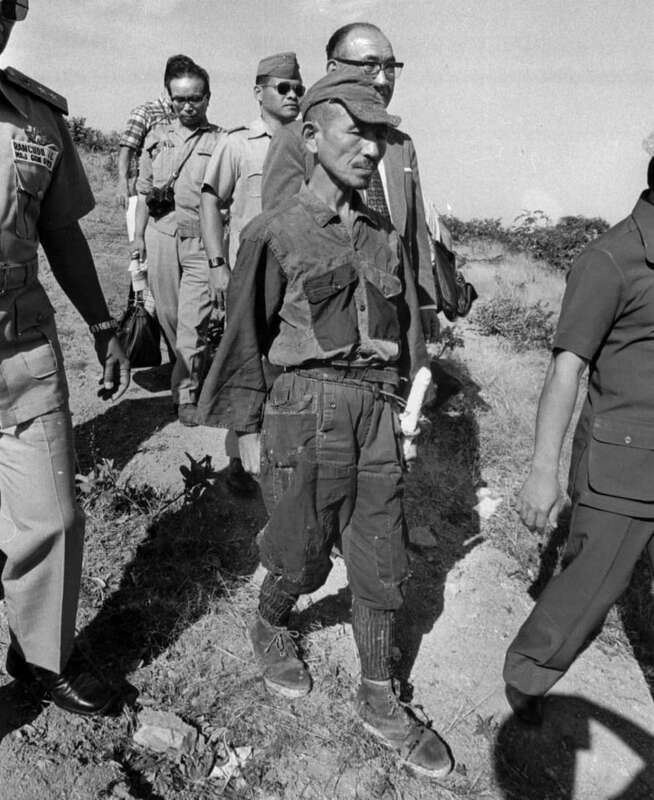 Hiroo Onoda, wearing his 30-year-old imperial army uniform, cap and sword, walks down a slope as he heads for a helicopter landing site on Lubang Island, Philippines, for a flight to Manila after coming out of hiding in the jungle. (The Associated Press)In December 1944, he was sent to Lubang, about 150 kilometres southwest of Manila. Most other Japanese soldiers surrendered when U.S. troops landed on Lubang in February 1945, though hundreds remained missing for years after the war. As he struggled to feed himself, Onoda's mission became one of survival. He stole rice and bananas from local people down the hill, and shot their cows to make dried beef, triggering occasional skirmishes. Suzuki quietly pitched camp in lonely jungle clearings and waited. "Oi," Onoda eventually called out, and eventually began speaking with him. Suzuki returned to Japan and contacted the government, which located Onoda's superior — Maj. Yoshimi Taniguchi — and flew him to Lubang to deliver his surrender order in person.